An Active Spring Season for the New Braunfels Market? San Antonio saw a 5% increase in median price at $223K with an average of 69 days on the market. With a large inventory and an increase of total sales of 9%, the start of spring appears to be active in the San Antonio Market. Spring Branch had a total of 32 closed sales this month however this was an increase of 52.4% compared to last February. Active listings were up 16.2% in with median price down 17% to $275K. The Bulverde market saw minimal activity during the month of February. 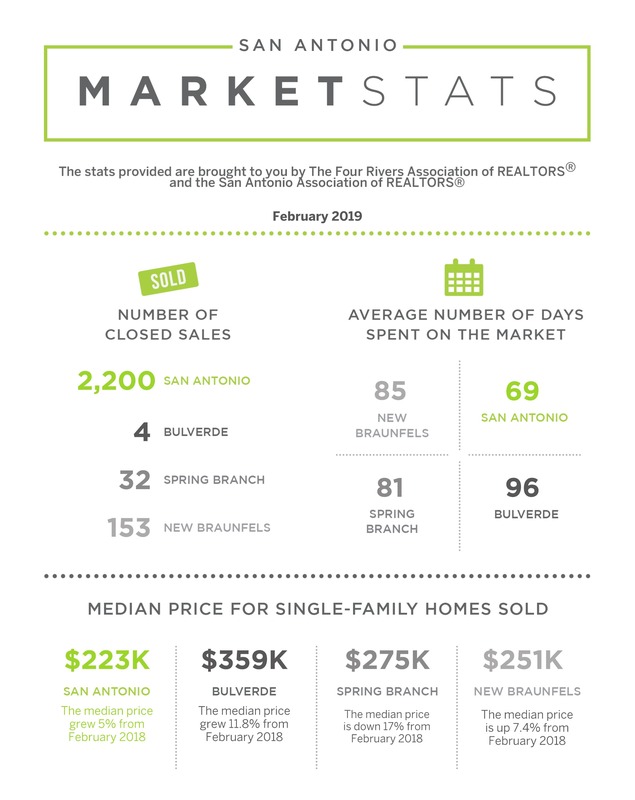 The New Braunfels market showed some signs of growth with active listings up 44.3% with a total of 668 active listings. In addition to the active listings, 153 sales closed an increase of 7.8% compared to last February. On top of closed sales and listings, the median price was up 7.4% to $251K. The numbers in this market are pointing to a possible active spring season.